A cold Monday saw Glasgow’s legendary King Tuts Wah Wah Hut welcome Lindsey Troy and Julie Edwards onto its hallowed stage for a night of bluesy Rock ‘N’ Roll. Deap Vally have been making a name for themselves over the past year with a string of high profile support slots, including dates with The Vaccines, Eagles Of Death Metal and Muse to name but a few. With a healthy hype surrounding them and an already devoted following, it was little surprise to see the words “SOLD OUT” scribbled on the Tuts chalkboard panel door on our arrival. After making our way through the bustling bar and passing several mini Glaswegian clones of the band, it was becoming clear that Deap Vally have also become fashion icons for a number of their fans. Thankfully for the paying public of King Tuts I must have missed the tweet that said short hot pants and tassel tops were the dress code for the evening. In true Rock ‘N’ Roll style the pair took to the stage a good 15 minutes after their 10.30 stage time, Lindsey swigging on a bottle of red wine (non tonic variety) while Julie sipped on straight JD. The heaving, compact venue gave the girls a raucous welcome with cheers, claps and screams mixed in equal measure. The set burst into life with the scuzzy roll of Baby I Can Hell, which saw Lindsey unleash her powerful machine-gun wail as Julie threw her hair around wildly giving one of the most animated drum displays I’ve seen in a long time. The true disciples of Deap Vally were easy to spot as the middle and front section of the audience turned into a sea of enthusiastic handclaps mid-song. Lindsey then welcomed us all with a confident “Hello Glasgow, Did you know that you are one of our favourite cities in the world?” before explaining that they had filmed their video for End Of The World in the city with one of the support bands Blindfolds. The love certainly seemed genuine rather than any on stage gimmick to receive applause, but either way it worked as the band were met with more fervent cheers as they battered into the venomous “Lies”. Julie’s animated drumming again caught the eye and I implore you to quickly disregard any Meg White comparisons that you’ve read, this girl is definitely way more than a human drum machine. The duo remained talkative between songs and seemed to want to create a positive party atmosphere throughout. Julie offered up a toast to Glasgow before playing debut single Make My Own Money, urging the crowd to “make it the best Monday night we’ve ever had”. The majority of the audience took her prompting and ran with it as they danced and jumped their way through the duration of the song. As Lindsey gulped more red wine from her bottle Julie shook her empty glass and said “I’ve run out of drink, I was talking to my dad before the show and he asked if I was drinking every night, and I poured less cause I felt guilty, this is for you Dad I love you”. An up tempo rendition of Ain’t Fair then gave way to the heavy rock sound of new song Raw Material with Julie’s head swinging around so much it almost smashed into the drum kit several times. When I say new song I really mean a song that hasn’t featured on the three singles that have been the bands only recorded output thus far. If the loud cheer and positive reaction to Lindsey’s question of “What did you guys think?” is anything to go by then I’m sure we’ll see it featured on the bands upcoming debut album later in the year. There was still time for yet more praise for Glasgow as the girls told us how much they loved the accent and how the last time they were in Sleazys “they made ten new friends in the bathroom at after a wardrobe malfunction.” The energetic main set rattled into its final stages with another new song entitled Walk Of Shame. Lindsey clutched her microphone tightly before introducing the number with a “stand loud, stand proud, do that walk of shame, you guys know what I’m talking about”. The crowd reaction to the new addition to their repertoire was again extremely positive, with the lyrical content no doubt encouraging the “taps aff” contingent of the crowd to daydream about a walk of shame of their own involving the band. Lindsey came to the front of the barrier and threw her guitar around as the member of the crowd who shouted for it earlier finally got what they wanted as the scuzzy apocalyptic thud of End Of The World rang out and reverberated through the Tuts PA system. In the song Lindsey screams the lyrics “come on everybody listen up, there’s no time like the present to open up our hearts”. Given the massive cheers and applause the Scottish crowd supplied in return I think it’s safe to say this King Tuts audience certainly felt obliged to open up their hearts to the Deap Vally girls. As the band left the stage clutching their fans T-shirts for that quilt, the familiar shout of “one more tune” struck up from the more vocal sections of the crowd. The girls didn’t keep the expectant room waiting as they quickly reappeared onto the stage to ear-splitting cheers and applause, with Lindsey explaining they were “gonna cool it down a little”. Before they cooled anything down there was still time for some more slightly inappropriate banter, this time from the band themselves, with drummer Julie exclaiming “that was a good show, you know how I know? My tampon fell out”, while Lindsey added without a second thought “I bet someone here would buy it from you”. After the laughter died down an interesting cover of I Put A Spell On You by Screamin Jay Hawkins followed and brought the curtain down on an incredibly successful evening for the girls from the Vally. During the song Lindsey put her own spell on a transfixed crowd as she played with her back to the venue wailing her guitar into the amps while dry ice engulfed her and the lights sparkled off her sequin top. As the band exited the stage for the final time to an even louder ovation Julie threw something into the crowd, was it a setlist? Or was it the tampon? I’m not sure; the second option is undoubtedly more Rock ‘N’ Roll but for whoever caught it I sincerely hope it was the first. 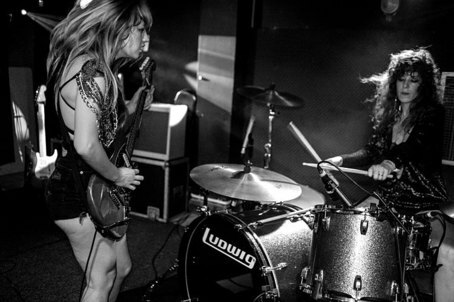 Are Deap Vally reinventing the wheel? Well the answers no, but they can certainly play and Lindsey has a fair set of lungs on her (no rudeness implied). While I’m sure some people will dismiss them as eye candy for the Jack White generation, their ability to write a catchy song and deliver it live shouldn’t be overlooked. They definitely proved with their performance at King Tuts that they have substance in their style. But hell, I guess if you can’t see past the short shorts and tassels to the music then if nothing else at least they are still a damn sight easier on the eyes than Jack White or Dan and Patrick from The Black Keys (sorry boys).